This is Reading Buses Optare Spectra, fleet number 701, registration number MRD 1. The registration number comes from the old Mayoral Limousine, which, was taken out of service in 1991. 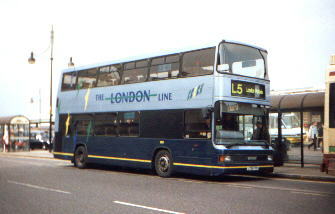 Originally the number plate was given to one of the company's most recent acquisitions, a bus from a fleet of 15 second hand ex-London Mk 2 MCW Metrobuses, fleet number 461. It wore the registration from 09-91 to 14-02-92 when it was transferred to the brand new 701. 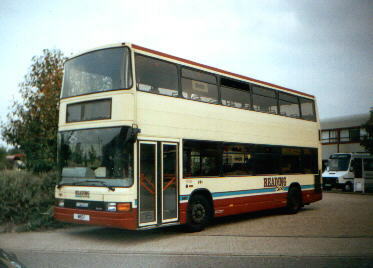 701 was exhibited at Coach & Bus '91 at the NEC in Birmingham. Below we see 701 in September 1997, and again on 23rd October 2003 but with new advert frames (that were fitted during 2003), and a poppy ready for remembrance day. 707 had a lower deck refurbishment and half repaint during March 2003. 701 followed during May, appearing to receive a new engine compartment door amongst other things. 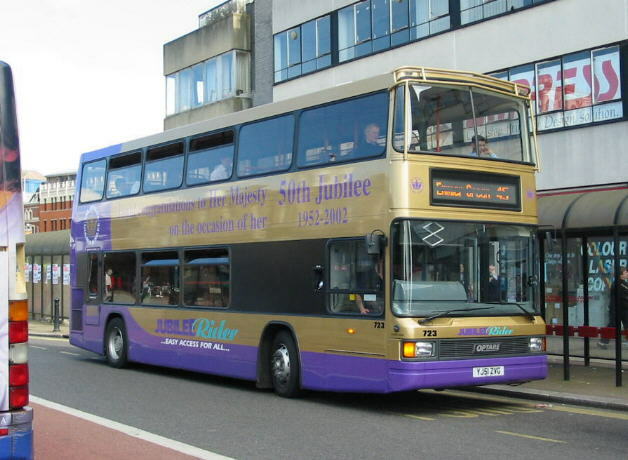 In November 2001 a deal was struck to exchange 10 Reading Optare Excels (951-60) for 6 Optare Spectras from Eastbourne Buses. Allocated fleet numbers 708-13 the Spectras arrived in reverse order. 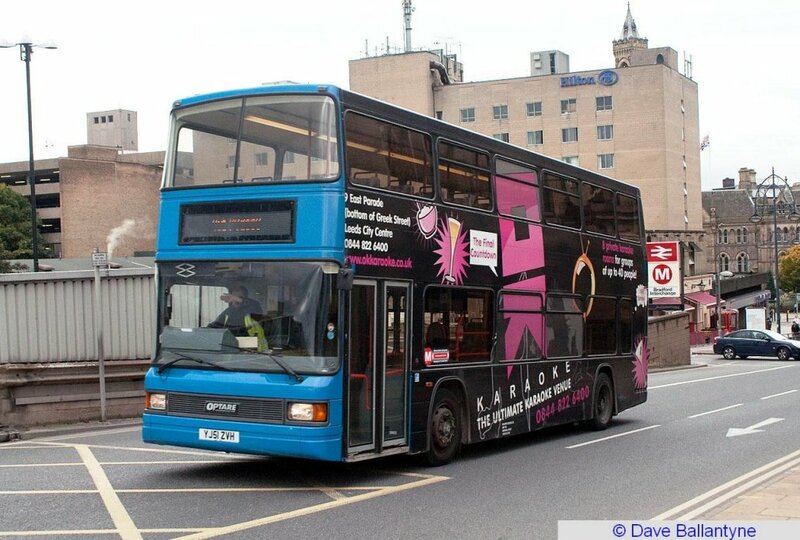 The first to arrive 713 arrived wearing only Reading base colours and had temporary DayTrack/NightTrack vinyls instead of Reading Buses ones until February 2002 when more of the new low floor Spectras dedicated to the service had been delivered. The second, 712 arrived in full DayTrack/NightTrack livery and is seen below at Great Knollys Street on 23rd November 2001 in this state, a few days before the launch of the NightTrack and DayTrack services. Then in February it was painted back into ordinary Reading livery. Thanks to Paul Hilton for this photo. In December 2002 708, 709, 711 and 712 received new Bright-Tech "Light-Tech" displays, and by February 2003 710 and 713 also had them. 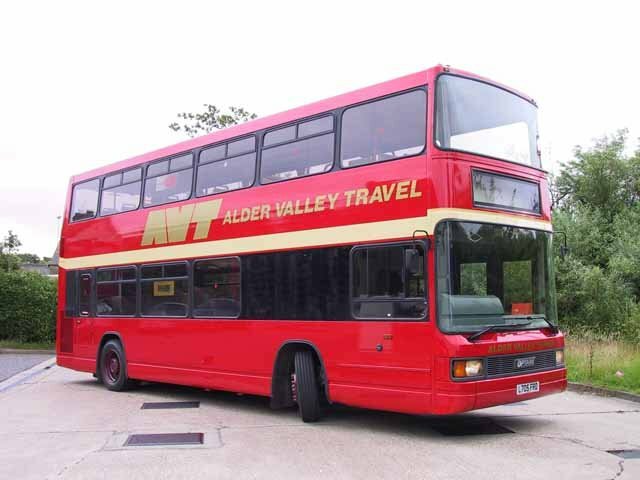 AVT ceased trading on 22nd May 2009, 705 passing to Beardsall, Four Marks (dealer) in April 2009, and then to Dining Bus Services in December 2009 for conversion into a catering vehicle for the TV and Film industry. At MASS Brightbus 701 fell out of use in around December 2010 and was repainted white during autumn 2011 before being advertised for sale on ebay in November 2011, passing into preservation on 8th May 2012 following some minor restoration work. 702 fell out of use by February 2009 and 707 by February 2012. 704 and 706 remained in use as of May 2012. Scanias 841-61 also displaced 708/9 to Newbury to help replace Metrobuses 455-8. 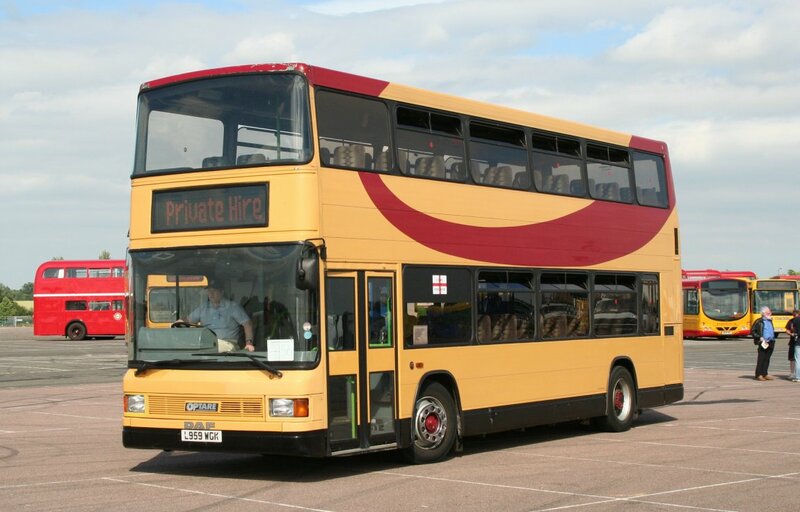 Following delays to the delivery schedule for 841-61, which were originally to enter service in November 2007, 708 went for repaint into Newbury livery during October 2007 and entered service there on 30th. 709 was repainted at North West Bus & Coach in early December 2007, returning on 7th December and entering service in Newbury on 11th. Whilst at Newbury 708/9 were named Thunderbird 2 and Thunderbird 3. 708-13 were gradually sold to The Green Bus having been replaced by ex Lothian Dennis Tridents. 708-10 went directly to Abellio Surrey on 18th April 2013 for their The Green Bus operations where they wear temporary fleet numbers 4001-3. 711/12 went to Birmingham on 15th May 2013 and 713 to Abellio Surrey on 15th May 2013 as their 4004. 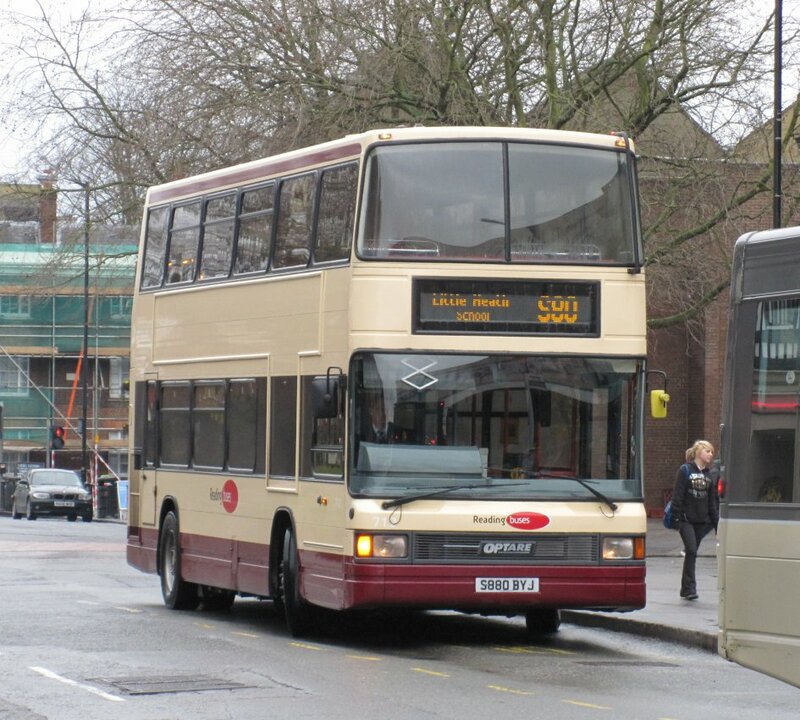 708-10/13 moved to Birmingham in July 2013, 708-13 being 201-6 in the Birmingham fleet. 708 went on loan to The Green Bus, Birmingham from 11th until 22nd January 2010 in exchange for 711. It returned in exchange for Trident 473 going on long term loan. 709 went on loan to Newbury on 20/21st September 2008 for the Newbury Show. 710 went on loan to Newbury from 10th May 2008, entering service there on 13th May until returning to Reading in early June. 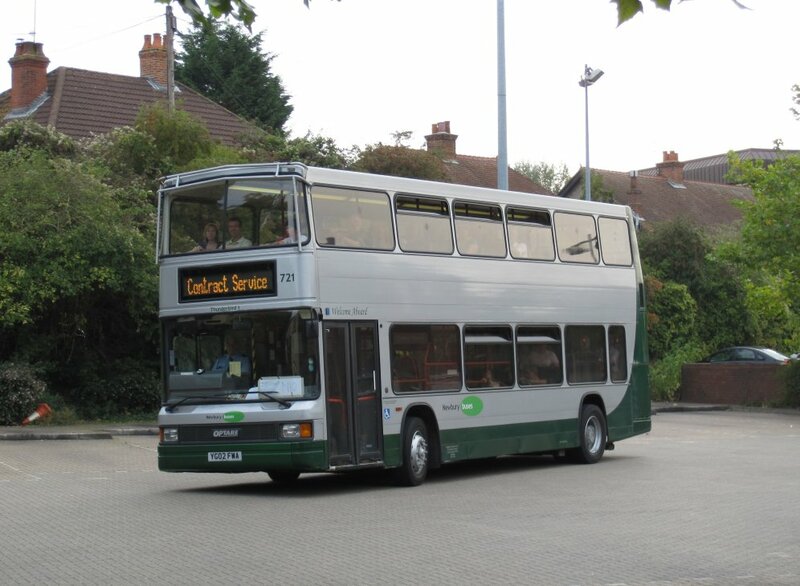 711 went on loan to The Green Bus, Birmingham from 9th until 11th January 2010 returning with a faulty gearbox. 711 went on loan to The Green Bus, Birmingham from approx 27th November 2010 and returned on approx 18th December 2010. 711 went on loan to The Green Bus, Birmingham from approx 4th January 2011 and returned on 31st January 2011. 712 went on loan to Newbury from 27th July 2012 until approx 12th August 2012 to provide extra capacity on Vodafone services whilst low floor vehicles were in use on Olympic services. Fourteen low floor Spectras were ordered in October 2001 for gradual delivery between November 2001 and March 2002. Nine were to operate the council tendered "DayTrack" and "NightTrack" services in a dedicated blue and white livery and the other five ordinary town services. These buses were Reading's first buses with the new style number plate system which does not allow fleet numbers to be included as part of the registration number. The buses are also in their own way revolutionary just like Reading's first Spectras were. Amongst the buses are the first Spectras to feature Euro 3 specifications (just 721-3 are thought to have had Euro 2 engines), and are the first buses in Reading to feature Bright-Tech "Light-Tech" high visibility LED displays all round. The rear display is capable of displaying exactly the same amount of information as on the front - not just the route number as had previously been standard, additionally the ultimate destination is also shown on the side. 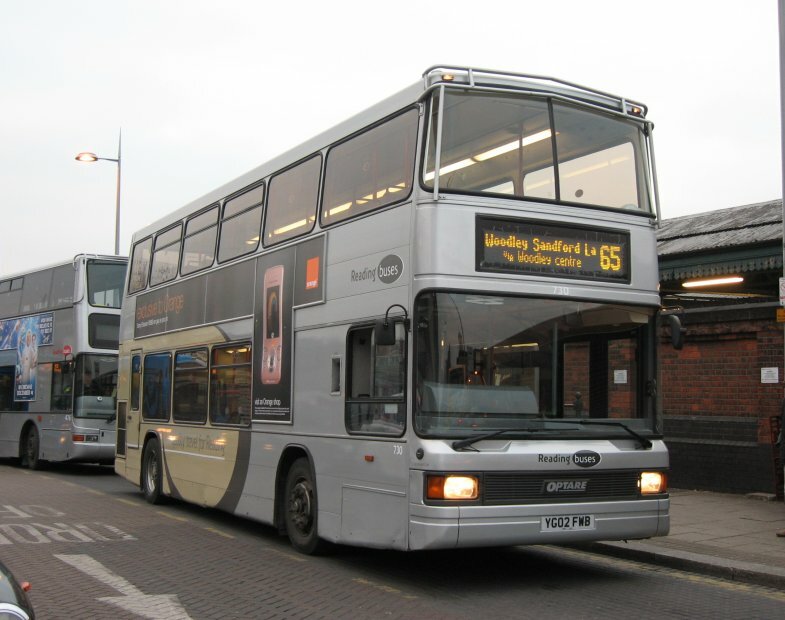 They have internal dot matrix displays on both decks for displaying promotional messages about the company, were the first vehicles fitted with cash vaults from new and the ones for the DayTrack/NightTrack services also had cab air conditioning. The first three, 721-3 entered service on 25th November 2001 in NightTrack livery, then 731-9 gradually followed and 724-5 last. As 731-9 started to arrive they allowed 721-3 to be sent back to Optare for repaint into LowRider livery (and 704-6/12 to Renault Trucks for repaint into standard livery). 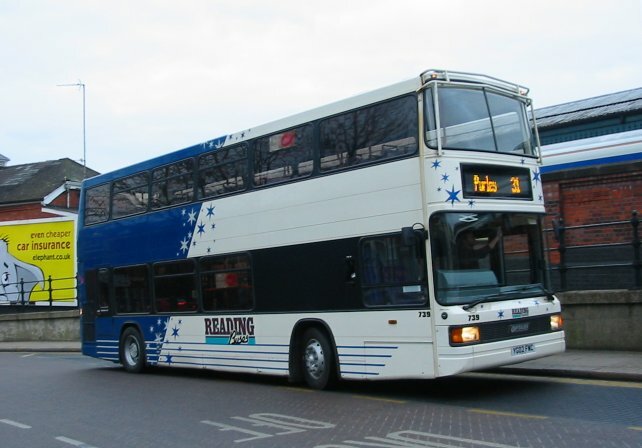 721 was sent back at the end of February or beginning of March and was returned to Reading in mid March, but was in standard Reading base colours rather than the modified low floor version. This meant that it had to be sent to Renault Trucks for rectification. 722 arrived back from repaint at the beginning of April, and was the first Spectra in LowRider livery to be noted in service. 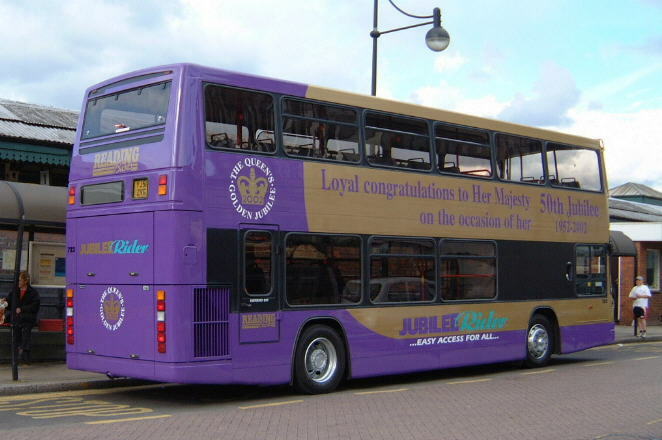 724-5 arrived in LowRider livery during mid-April, and then 723 arrived back at the very end of April in a special JubileeRider livery to celebrate the Queen's Golden Jubilee. Below is a picture of 722 on 3rd April 2002, taken by James Cusworth at the Three Tuns. Here is 723 on 27th May 2002. The rear shot was taken a few weeks earlier on the 1st by James Cusworth. 731 arrived soon after 721-3 but had only entered service by mid December. 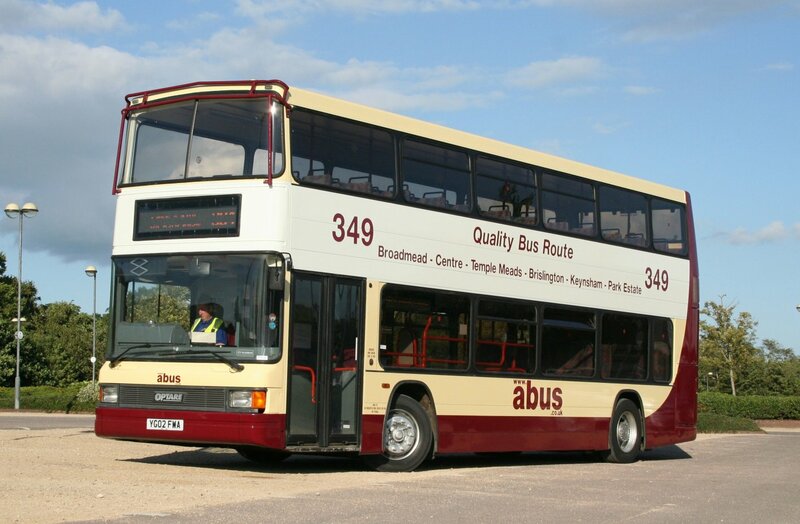 732 arrived and entered service a week before Christmas, and 733 during the week after Christmas. 734-8 slowly arrived during the first three months of 2002, all in DayTrack/NightTrack livery, and the last 739 arrived at the beginning of April. This slow delivery meant that the step entrance Spectras could also be repainted (back) into town livery at an equally slow rate, and 721-3 into LowRider livery. 712 was treated 'in house' at the beginning or March and 706 was sent to Renault trucks at about the same time. 705 appeared back in town livery at the end of March, and both 705 and 706 received tree deflectors identical to those fitted to the new Spectras whilst they were being done. Eventually 701-4/7 also gained these. 739 went into reserve in October 2005 following a low bridge accident on 16th October 2005. The bus was operating rail replacement services between Windsor and Stains for South West Trains when it became wedged under a bridge over Laleham Road in Staines following some kind of misunderstanding over the route. 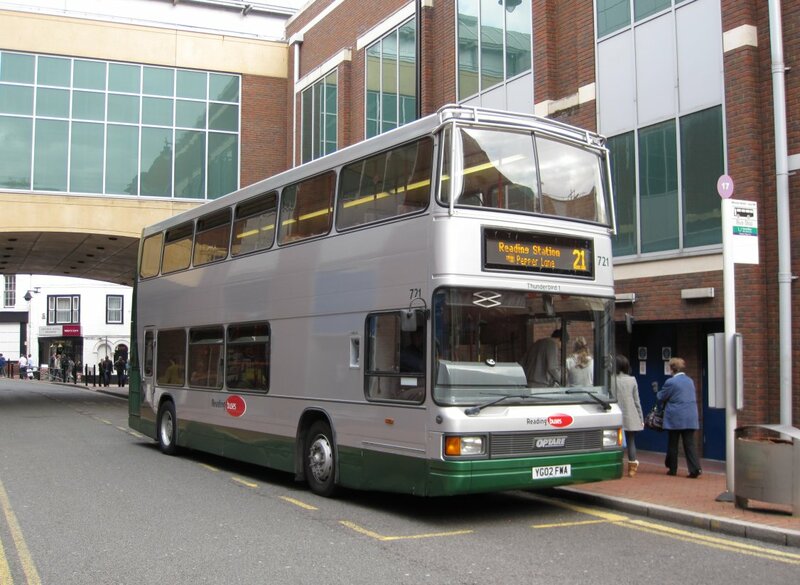 It returned to service on 20th February 2006 in Reading Buses 'quality travel' generic grey livery, and in the process became the first existing double decker to be repainted into the livery. 738 was the third repaint into generic livery in December 2006. Whilst with Ensignbus in August 2008 former 733 (Ensign 104) was badly damaged by fire whilst on rail replacement duties at London Victoria. It passed from Ensignbus to MASS Brightbus in March 2009. 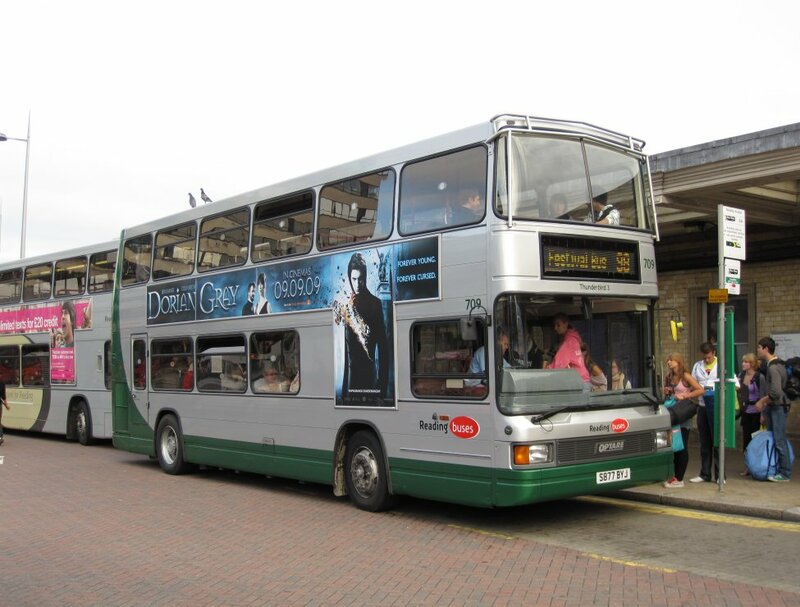 It then transferred back to Newbury on 5th February 2010, regaining Newbury Buses logos. 725 followed to Norfolk Green in July 2010. 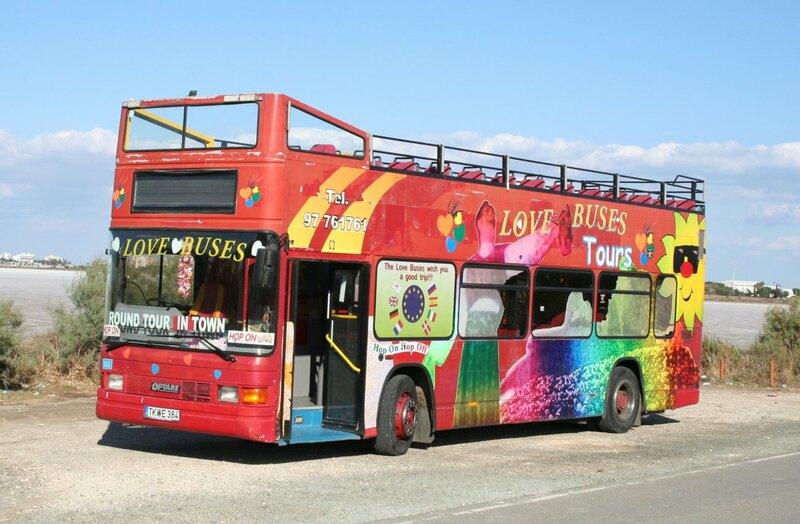 The remaining six low floor Spectras 722-4 and 728-30 were advertised for sale in August 2010 pending the arrival of Alexander Dennis Enviro 400Hs 201-6 in December 2010. 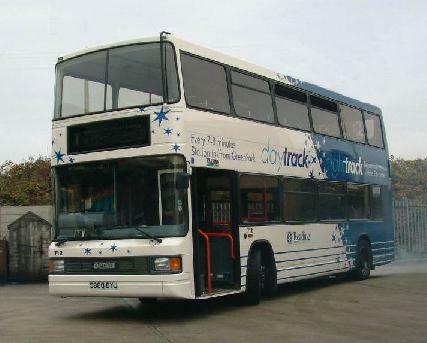 730 (originally 738) was sold to Norfolk Green in September 2010, followed by 728 on 6th January 2011 and 729 on 11th January 2011. 722-4 followed in April 2011 - 724 departing first, followed by 723 arriving there on 21st following repaint, and 722 departing for Norfolk Green's painters on either 20th or 21st. 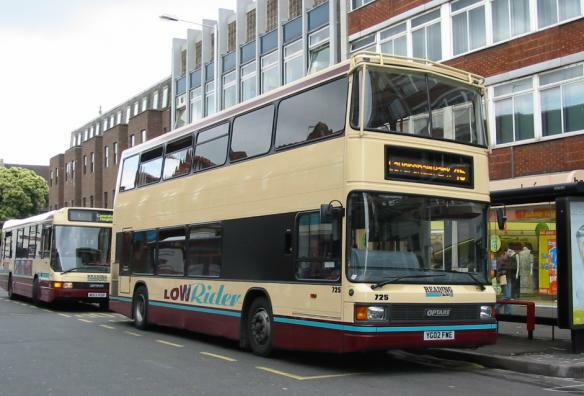 722 was therefore both the first low floor Spectra to join the town fleet and the last one to leave. 721 went on loan to The Green Bus, Birmingham from 20th February 2010 until 19th March 2010. 722 went on loan from Reading to Newbury on 19th and 20th September 2009 for the Newbury Show. 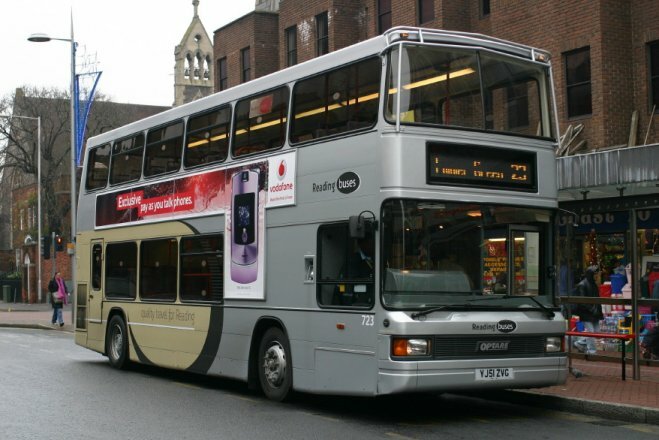 722 went on loan from Reading to Newbury from approx 18th March 2010 until 3rd April 2010 at the latest. 723 went on loan to The Green Bus, Birmingham on 23rd June 2009 until the end of the academic year in July. 723 went on loan from Reading to Newbury around 9th August 2010 for approximately one week to cover for 501. 724 went on loan from Reading to Newbury on 19th April 2009 until approx 6th July 2009 to help cover enhanced frequencies on the Reading - Newbury service following the renumbering from 102 to 1. 724 went on loan to The Green Bus, Birmingham from 6th-13th February 2010. 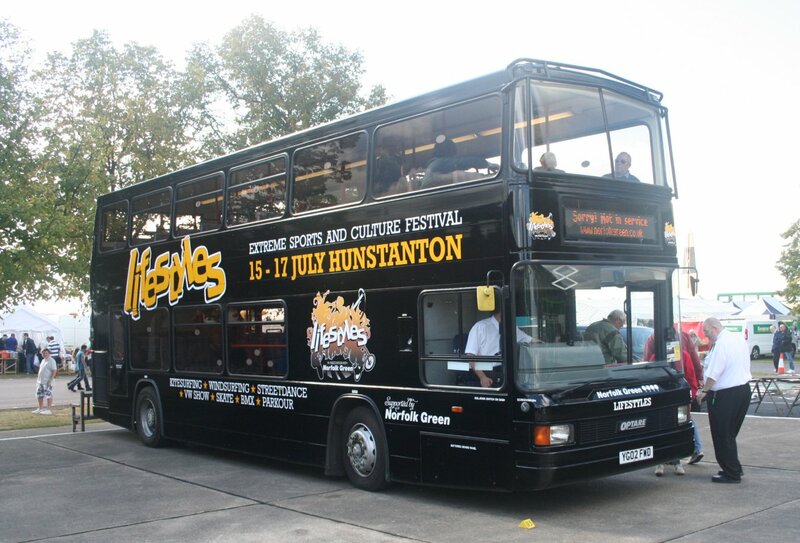 724 went on loan to Southern Vectis, Isle of Wight from 9th-14th June 2010. 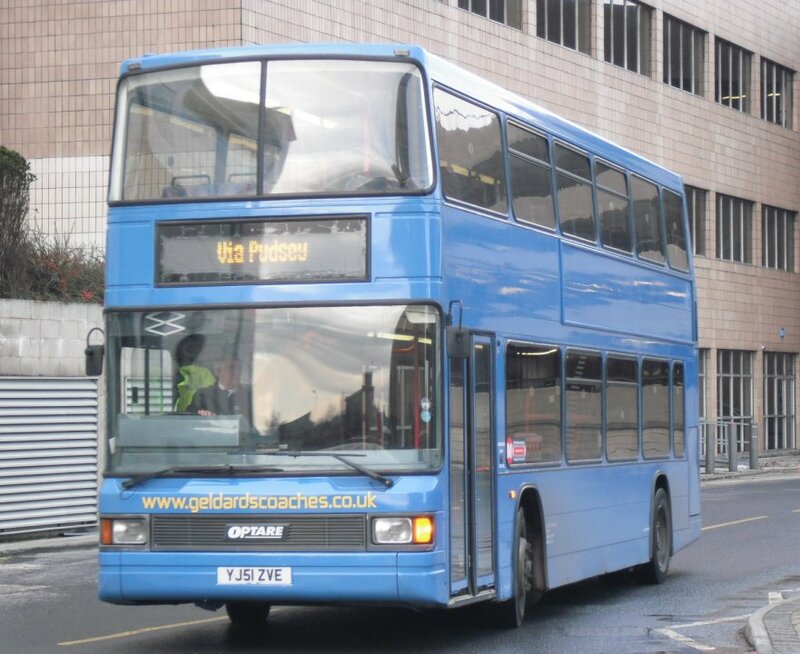 725 went on loan to The Green Bus, Birmingham from 6th-13th February 2010, going straight back into service on football specials on 13th. 725 went on loan to Southern Vectis, Isle of Wight from 9th-14th June 2010. 726 went on loan to The Green Bus, Birmingham from 6th-20th February 2010. 728 went on loan to The Green Bus, Birmingham on 22nd June 2009 until the end of the academic year in July. 728 went on loan to The Green Bus, Birmingham from 20th February 2010 until 6th March 2010. 728 went on loan to Southern Vectis, Isle of Wight from 9th-14th June 2010. 729 went on loan to Southern Vectis, Isle of Wight from 9th-14th June 2010. 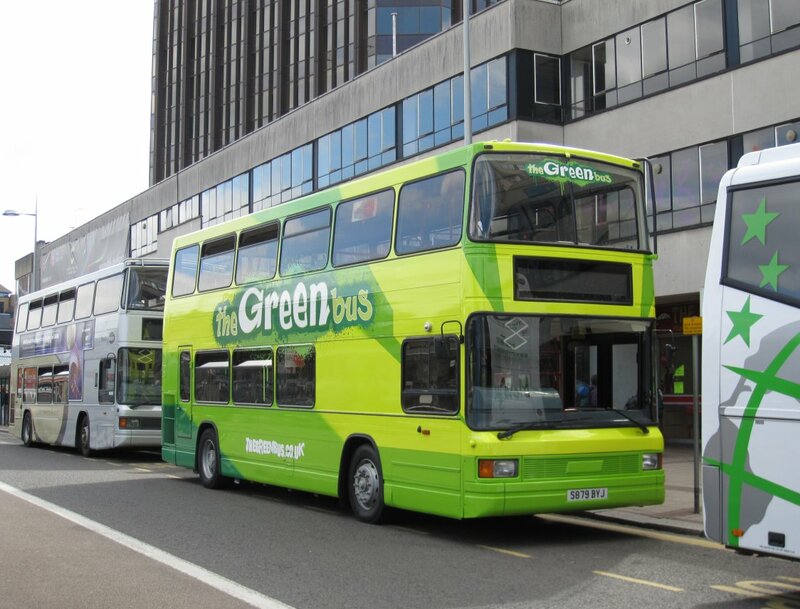 730 went on loan to The Green Bus, Birmingham from 20th February 2010 until 6th March 2010. 730 went on loan to Southern Vectis, Isle of Wight from 9th-14th June 2010. 731 went on loan to The Green Bus, Birmingham from 20th February 2010 until 19th March 2010. Norfolk Green was acquired by Stagecoach on 18 December 2013, with 725, 726, 727, 728, 729, 738 passing into their ownership. All were gradually withdrawn and advertised for sale by Southdown PSV. 726 passed to Bus of Hope, Newbury in March 2016, and was in use as a mobile resource centre by August 2016. 725/7 passed to Brecks Coaches in June 2016. 728 passed to Sargents in December 2016, entering service there on 26th. 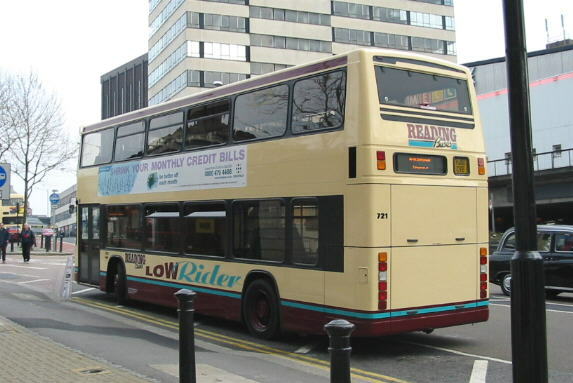 Along with the seven original step entrance buses, Reading bought two Spectra coaches (751-2), which were used on London Line services until Reading withdrew them in May 2000. For a few months before the London services were withdrawn the coaches wore the Goldline livery below but with special London Branding in place of the private hire bits. 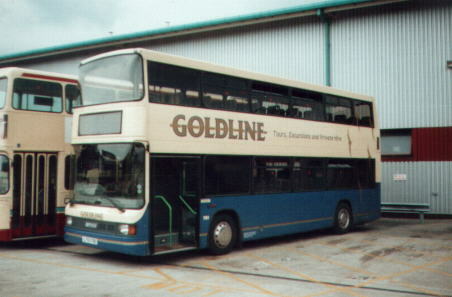 They were then transferred to the Goldline private hire fleet with corrected branding until November 2002 when they were withdrawn. The two pictures below show 751, in the first it is at the Station preparing to leave for London on the L5 route to London Victoria in it's original London Livery, and at the Great Knollys Street depot in it's final Goldline private hire livery. 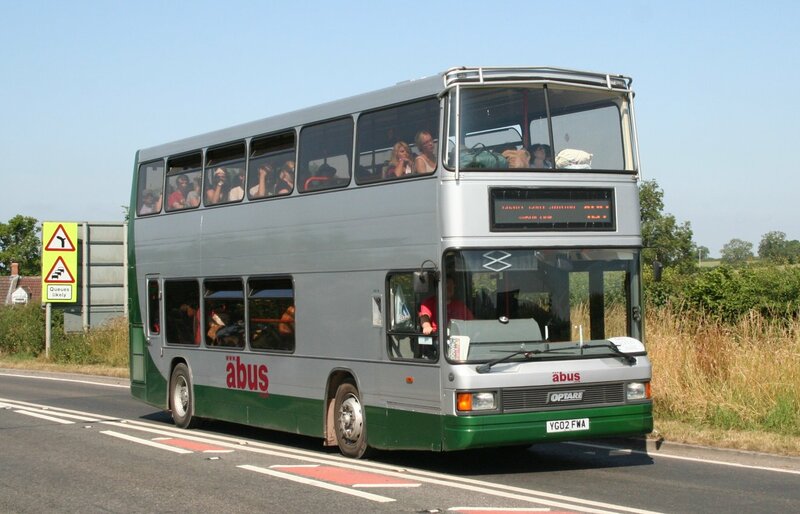 The duo passed to Holmeswood Coaches where they were reregistered MUI 4841/2, and then to Shamrock Buses, Poole by May 2005. 751 is seen below with Shamrock on 14th August 2005. Thanks to David Oborn for this photo. 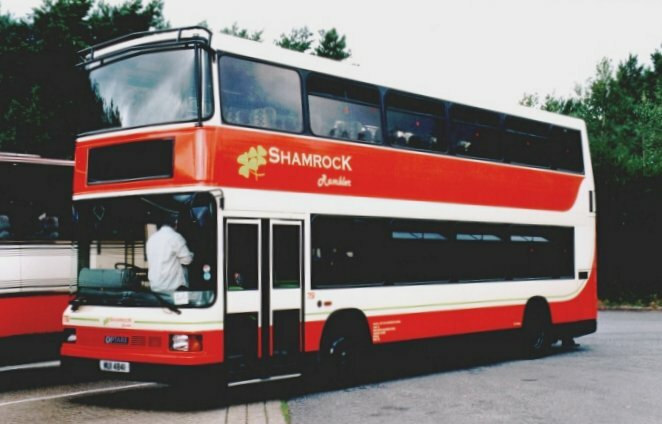 From Shamrock the pair were sold during August 2006, with 751 being acquired by Westbus at Hounslow who are managed as part of Armchair, the coaching side of Metroline. 752 went to Bedfordshire County Council. By July 2007 751 had been reregistered D5 KKA. 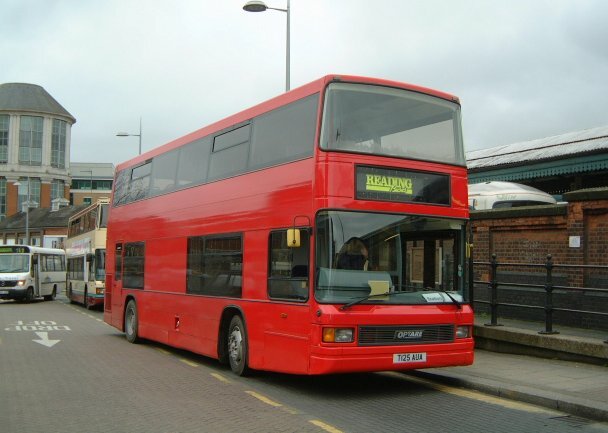 In September 2010 it passed to Courtesy, Chadderton where it was reregistered to YCZ 101, and then by August 2011 it had passed to Cockney Coaches, Romford. Three exLondon Sovereign Spectras were hired from Dawson Rentals in March 2006 to assist the fleet pending the late delivery of Scania OmniDekkas 819-26. 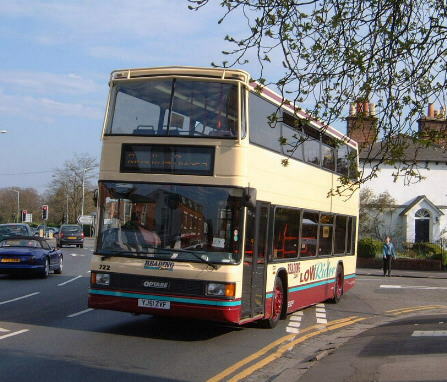 The vehicles, hired by Scania and paid for by East Lancs were used solely on routes 31 and 33 whilst the rest of the Reading fleet covered for Excels 901-10 which had just been sold. Temporary fleet numbers 2000-2 were allocated, with 2001 arriving in the workshops on 22nd and 2000/2 on 23rd. 2001 was originally numbered 2000 until the delivery of the second two the day after. 2001/2 were used in service from 27th March 2006 and 2000 from 29th. The last sighting of one in service was 2002 on 4th April, and then the next day 819-26 started to enter service. 2001 at Reading Station on 27th March 2006. Thanks to James Cusworth for this photo. 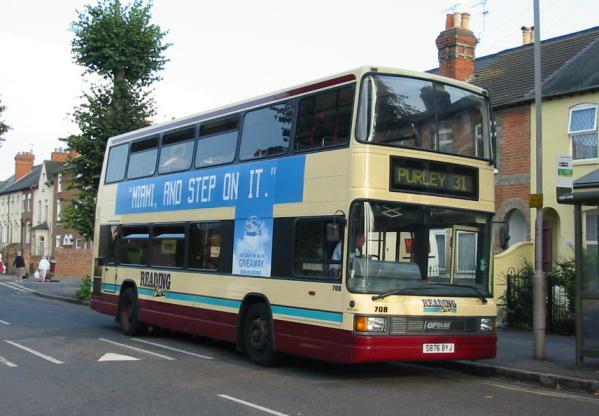 The temporary measures inside these vehicles included an old Reading Buses logo along with the company's legal details on a sticker in the nearside window, and papers with the route number and destination in the front window. 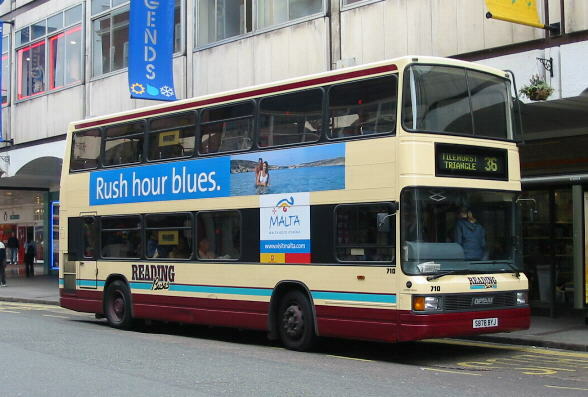 2001 also had an old Reading Spectra destination blind fitted, but it was only ever set to the Reading Buses logo. The centre doors were kept shut out of use. 2002 at Reading Station at lunchtime on 27th March 2006. Thanks to James Cusworth for this photo. 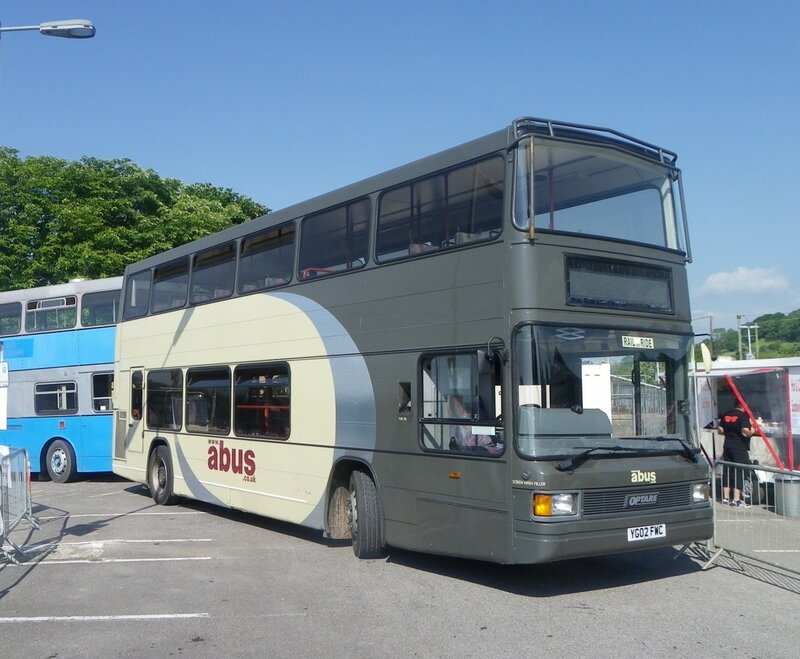 The buses have had a patchy history, leased by London Buses they were loaned to Capital logistics, Arriva and London Sovereign before finally being sold to a dealer. They appeared on the notorious South London Route 60 (the route no-one wanted), and were then despatched to the 114 at London Sovereign.